SEACRET Direct is a global skin care company whose products offer advanced skin and hair care solutions using minerals from the Dead Sea in Israel. Using a Relationship Marketing business model, SEACRET brings their products directly to consumers through a network of SEACRET Agents. Seacret provides solutions to transform lives. People choose to join Seacret for a variety of reasons, but many are consumers who wish to enjoy Seacret products at wholesale prices and/or to retail the products. Many refer other customers every now and then and may receive some commissions that may help offset the cost of their products. Others join Seacret to earn a little extra money to supplement their full-time incomes, and some join to build full-time businesses selling Seacret products. Everyone who joins Seacret enjoys low start-up costs and a money-back satisfaction guarantee (1). Building a Seacret business can be rewarding, but like any worthwhile business, results will vary depending on your skills and efforts. Seacret does not offer “quick riches” and there are no guarantees of success. Building a long-term business is hard work and Seacret is no different in that regard. Unlike most businesses, however, building a Seacret business does not require a significant investment in inventory, sales tools or other materials. Seacret Agents are strongly discouraged from purchasing more than they can reasonably use or sell in a given month, and they are protected by the satisfaction guarantee as well as a one-year buy back policy for those who choose to leave the business. Those who decide to build a Seacret business can earn money in various ways, including commissions for product purchases made by new and existing customers, product introductory bonuses and retail sales, to name a few. Seacret Agents also can be rewarded for helping other Agents achieve success. However, Agents are not paid for recruiting new Agents. They are paid solely based on product sales to end consumers. For additional information, the Seacret Compensation Plan is available to all Seacret Agents at www.seacretdirect.com. 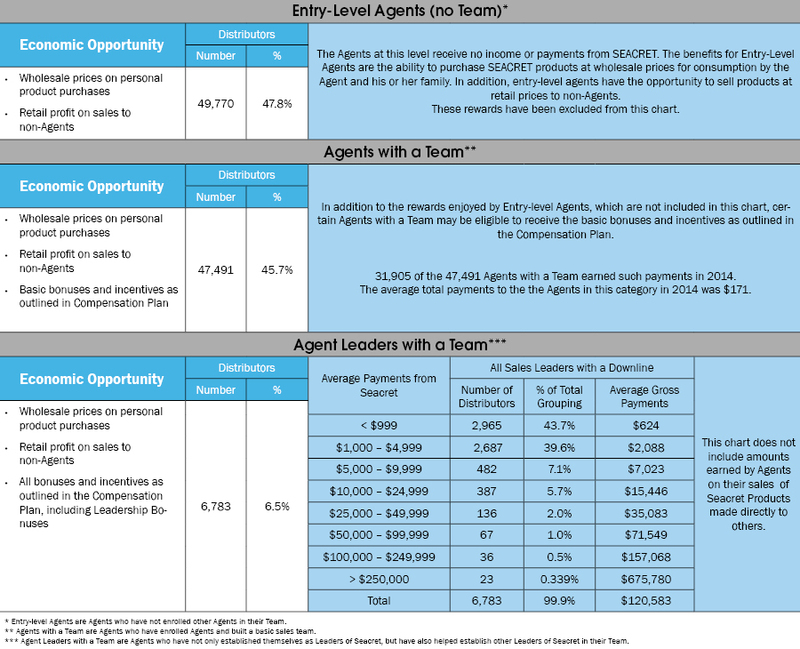 The chart below is designed to help prospective Agents better understand the different ranges of average compensation that Seacret pays to its Agents. It’s important to note that a significant number of those who join Seacret don’t intend to make money at all—they just want to purchase the products at the wholesale prices. For potential Seacret Agents to make an informed decision, we are offering the following chart to show the different ranges of average gross compensation that Seacret pays its Agents. 2 The chart below does not include any retail/wholesale profit that an Agent makes from selling Seacret products to others outside of the Seacret Compensation Plan, but are reflective of compensation received through the Seacret Compensation Plan. 3 Nor does the chart disclose the operating expenses that may be incurred by those Agents who wish to build an independent Seacret business. Such operating expenses include, but are not limited to, the amount that was paid to become a Seacret Agent, product purchases, advertising and promotional expenses, training, travel, telephone and Internet costs, business equipment, and miscellaneous expenses. (1) 30 days, no questions asked on new purchases; one year on the return of resalable inventory upon leaving the business. See the Seacret Policies and Procedures for full details. 1	Further information regarding Seacret’s Compensation Plan may be found at www.seacretdirect.com. 2	These figures represent average gross compensation and do not include expenses incurred by an Agent in the operation or promotion of his or her business. Such expenses can vary widely, and may include advertising or promotional expenses, product samples, training, travel, phone and internet costs, and other miscellaneous expenses. 3	The figures in the chart below should not be considered guarantees or projections of an Agent’s actual gross compensation or profits. Success with Seacret results only from the time, energy, and dedication one puts into his/her business. This earnings disclosure contains data from all markets where Seacret conducted business in 2014. (Ranges are listed in U.S. dollars.) The earnings listed in this chart are not a guarantee or projection of actual income that an Agent will earn through his or her participation in the Seacret Compensation Plan, if any. Any representation or guarantee of earnings would be misleading. Success with the Seacret Compensation Plan results only from successful sales efforts and requires persistence on the part of the Agent. In 2014, 63% of all Seacret Agents received no income or payments from Seacret. The average income of ALL Seacret Agents received from Seacret in 2014 was $535.